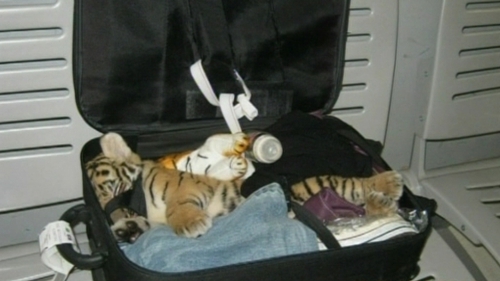 Airport customs in Bangkok found a two-month-old tiger in a luggage bag filled with stuffed tiger toys, which was checked-in for an international passenger flight. The dazed and drugged cub was concealed in an oversized bag packed with the toys and bound for Iran. It was discovered by Thai authorities using an x-ray machine at Bangkok's Suvarnabhumi Airport earlier this week. A 31-year-old Thai woman was detained for questioning and was unable to explain why there was a real tiger in the bag. 'The woman trying to check in the oversized bag denied any knowledge of the tiger. She said she was carrying it for someone else,' Nirat Nipanand, an airport customs official in charge of tracking animals, told Reuters. An investigation is under way and DNA samples are due to be taken to find out the species of the cub. Authorities will also try to determine whether it was caught in the wild or bred in captivity. Tiger populations in Asia are under constant threat by poaching and illegal trade. Wildlife groups have been lobbying governments to increase monitoring and enforce tougher penalties. 'We applaud all the agencies that came together to uncover this brazen smuggling attempt', Chris Shepherd, deputy regional director for wildlife trade monitors TRAFFIC, said in a statement.